At the track, see how weather and elevation will affect your times so you can instantly predict your dial-ins using current track conditions. Predict Elapsed Time and top speed for 1/4 mile or 1/8 mile runs. No computer, charts or workbooks needed. And best of all, It's Guaranteed! at different tracks affect my Horsepower? Do I need to make jetting changes? How will the weather on race day impact my ET? Changes in temperature, absolute pressure and relative humidity can affect your speeds and times. With the Hot Rod Calc, you can make ET predictions using ideal (or Motorsports Standard Atmosphere) conditions and you can enter the measured conditions at the track to see how they can change your ET and speed. You can even calculate water Dew Point to know when moisture will accumulate on the track. A wet track can change everything. How will elevation and absolute pressure at different tracks affect my Horsepower? Just enter your race car's weight and measured horsepower, then key in the track elevation and current absolute pressure and instantly see how it affects your car's horsepower. With the Hot Rod Calc, you can calculate the Air Density Index based on the current weather conditions and compare these with your baseline numbers to see if you need to make changes to your air/fuel settings and jet numbers. 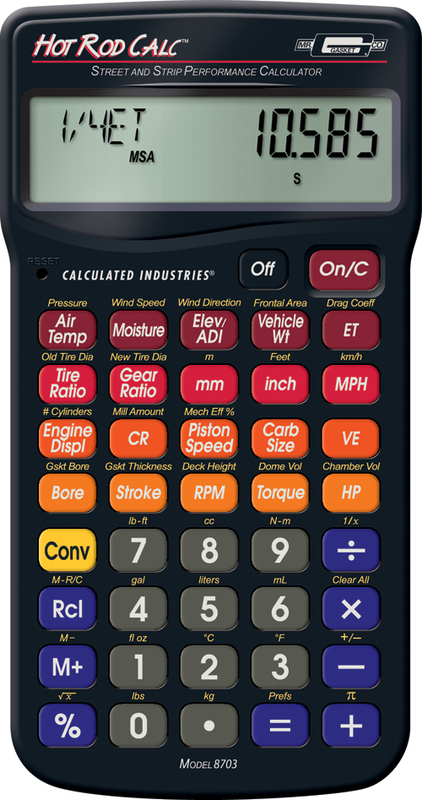 The Hot Rod Calc User Guide even has a Holley® Jet Guide Chart to help you. With the Hot Rod Calc, you can enter or calculate your vehicle's quarter-mile or 1/8 mile drag strip elapsed time in seconds! Plus, calculate the vehicle's horse power correction factor (HPc) and Motorsport Standard Atmosphere (MSA) adjusted elapsed time and speed when the appropriate weather conditions are entered. Unlike costly computer based systems or those tied to elaborate weather stations, the pocket-sized Hot Rod Calc goes anywhere and uses readily available weather data to improve your ET predictions and get you more wins! Enter your current local air temperature. Enters the current local absolute pressure as reported by a weather meter such as an aircraft altimeter or absolute barometer (not corrected by Internet, local radio or TV news sources). Enters the current local relative humidity; calculates current local water vapor pressure, saturation water vapor pressure, and dew point temperature. Default value is 0% RH. Enter wind speed and direction to predict effect on ET. Enters current local elevation; calculates air density index and density altitude. Default elevation is 0 feet. Default air density index is 100%. Default density altitude is -0.001 feet (effectively 0 feet). Enters or calculates the vehicle's weight. Vehicle weight typically includes the driver's weight. Calculates vehicle weight given ET and HP or MPH and HP. Enter vehicle's frontal area when correcting ET predictions for wind conditions. Enter vehicle's drag coefficient when correcting ET predictions for wind conditions. Calculate speed given Vehicle weight and HP or Tire Diameter, Gear Ratio and RPM. Convert to kilometers per hour. Increasing Compression Ratio can significantly increase your engine's power. Increasing compression by one ratio can increase horsepower 3.5%. Two ratios can increase HP by 6.5%. Look what this can do for a 340 HP engine. Another way to increase Compression Ratio is to have your engine's heads milled. To calculate the Mill Amount, just enter your current Stroke and CR, then your target CR and instantly see the amount you need to have milled from your heads. You could simply check the factory specs on the engine displacement of your vehicle, but that number is usually a rounded up or down number. If you are building an engine to your specification, or modifying one and want to know the effects on displacement by changing bore and/or stroke, the Hot Rod Calc can do it. * Enter Bore and Stroke to calculate Engine Displacement, which is shown in cubic inches, cubic centimeters and liters. * If you want to increase displacement, enter your target displacement and current stroke to calculate the new Bore. Or enter the Engine Displacement and current Bore to calculate the new Stroke. The aim of most engine modifications is to improve Volumetric Efficiency  which is the amount of air/fuel mixture that is drawn (or forced) into a cylinder. To calculate the possible carburetor sizes you can use, just enter your engine's Displacement and its peak horsepower RPM, and you'll see 3 or 4 (if you entered a User VE) possible sizes. If you know your engine's measured airflow capacity in CFM, you can calculate your engine's Volumetric Efficiency. Just enter RPM, Displacement and airflow capacity to calculate VE. If you're planning an engine build, a high piston speed sounds like a good goal. But, if you don't want your new motor to grenade on you, you want to make sure it's not too high. With the Hot Rod Calc you can enter or calculate it, given values for RPM and Stroke length. You can enter or calculate the engine horsepower; calculate Horsepower Correction Factor (HPc) and Motorsport Standard Atmosphere (MSA)-adjusted horsepower when weather conditions are entered; calculate flywheel horsepower given RPM and torque; calculates rear wheel horsepower given ET and Vehicle Weight. or calculate engine torque in lb-ft or N-m. Enter your engine's mechanical efficiency, which is the percentage of power that makes its way to the flywheel after friction losses from rings, pistons, oil pumps, etc. Default value is 85% but can be changed. It is used to calculate Horsepower Correction Factor, which can be used in estimating elapsed time. One of the powerful functions of the Hot Rod Calc is its ability to quickly tell you what the effects of new, different-sized tires will be on your vehicle's performance and its speedometer readings. You just enter your current tire diameter and final-drive gear ratio, then enter the new tires' diameter and you'll see how it effects your speedometer and gear ratio. You can enter or calculate your overall gear ratio, as well as gear ratios adjusted for manual and automatic transmissions. Enter and calculate for tire diameter, RPM or speed.